Shri Verma, MD-UGVCL receives 'Rastriya Gaurav Award'………..
Shri A. K. Verma, IFS Managing Director of Uttar Gujarat Vij Company Ltd., Gujarat received the prestigious 'RASHTRIYA GAURAV AWARD' at a glittering function organized at India Habitat Centre, New Delhi on 7th January, 2010. 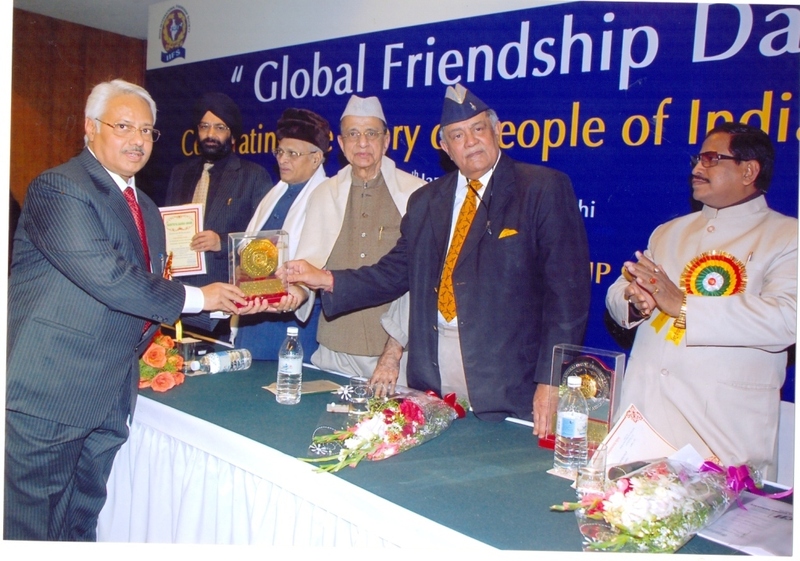 The Award was conferred upon by Shri Bhisma Narayan Singh, former Governor of north eastern states and Tamil Nadu. Shri GVG Krishnamurthy, former Chief Election Commissioner and General Ajay Singh, former Governor of Assam also blessed the occasion. Shri Verma has been awarded for outstanding services, achievements and contributions to the public service. Delhi based NGO India International Friendship Society (IIFS) has been organizing the awards since long. These awards are given to successful and meritorious Indian personalities in various fields like science and technology, education, industry, fine arts, politics and social works, in lieu of the yeoman services rendered with excellence in their respective field. IIFS recognized Shri Verma's contribution to forestry and environment, tribal development and power sector. He has been advising Government of India on international environmental issues particularly those pertaining to Commission of Sustainable Development (CSD) and United Nations Convention on Combating Deserts and Desertification (UNCCD) since last six years. His role in designing Van Bandhu Yojana of Gujarat and improving overall performance of UGVCL also has been considered. IIFS praised his contribution and termed his fight in life as a worthy example to inspire others towards certain remarkable achievements. This year, Awards were given to sixty six persons in the country from different walks of life including orthopedic surgery, teaching, mathematics, scientific research instrumentation, environmental studies, distant education, physics, veterinary sciences, applied chemistry, social work, trade union, and public service, etc. The illustrious past recipients of Award include: Beatified Mother Teresa, former Vice President B D Jatti, Governor Justice M Fatima Beevi, Gen. G V Krishna Rao, former Air-Chief Marshal N C Suri, former Chief Election Commissioner GVG Krishnamurthy, Union Minister Veerapa Moily, former Director of CBI Joginder Singh, Finance Minister of Gujarat Vajubhai Vala, renowned cardiologist Dr. Naresh Trehan, playback singer S P Balasbramaniam, educationist Dr. Abid Hussain, sarod maestro Ustad Amjad Ali Khan , cricketer Sunil Gavaskar among many others.